As we approach the end of another year, I am once again very fortunate indeed to have fellow Washington D.C. winos at the ready, willing to bring some lovely “claret” (just love that word 😉 ) from fine vintages. 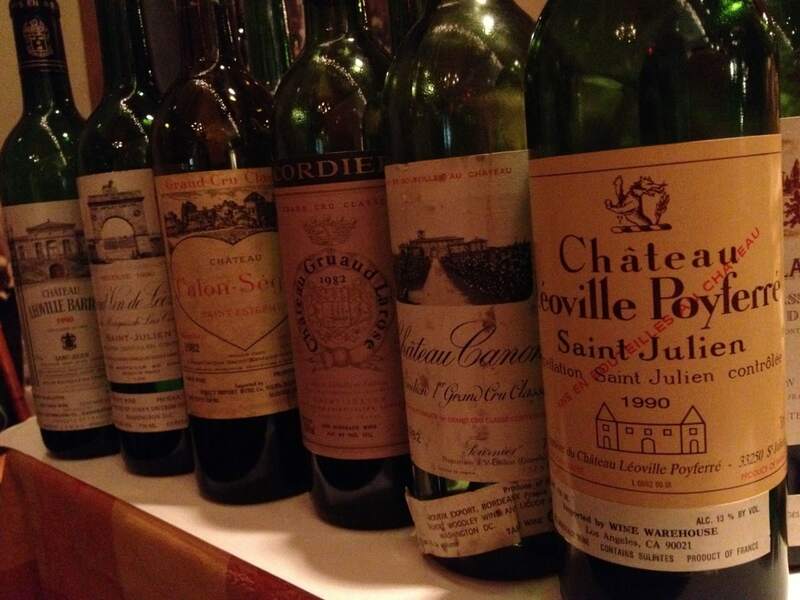 The ever generous and serious wine lover Randy McFarlane called us together for a dinner to taste both 1982 and 1990 Bordeaux among others. 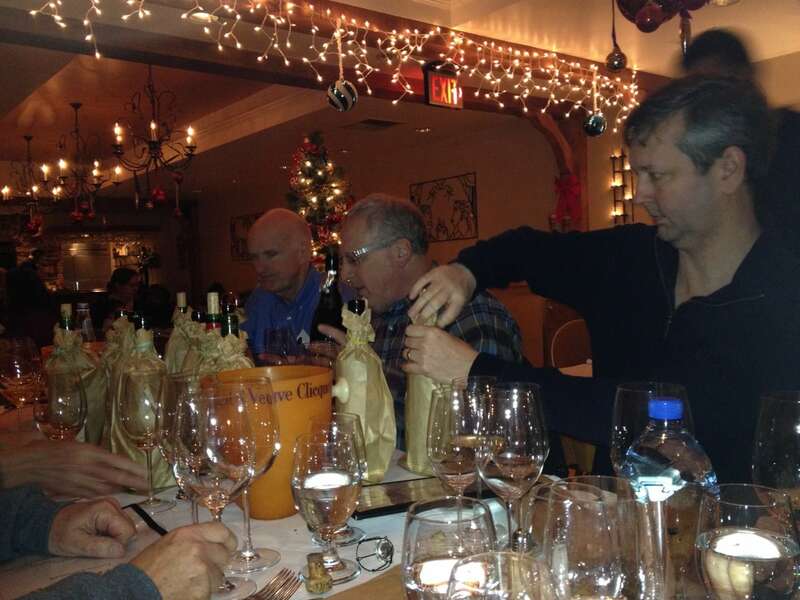 So on Monday evening 30 December 2013, each of us – Randy, Mark Arnold, Ben Delancy, Ken Barr, David Zimmerman, Kevin Shin, Paul Marquardt, Ken Brown and Charles Stewart – brought a bottle to enjoy over dinner at Lavandou, a great BWOW friendly restaurant run by the always charming Florence Devilliers and her amenable staff. Just for fun we decided to bag them and try them at random, attempting to guess which was which. 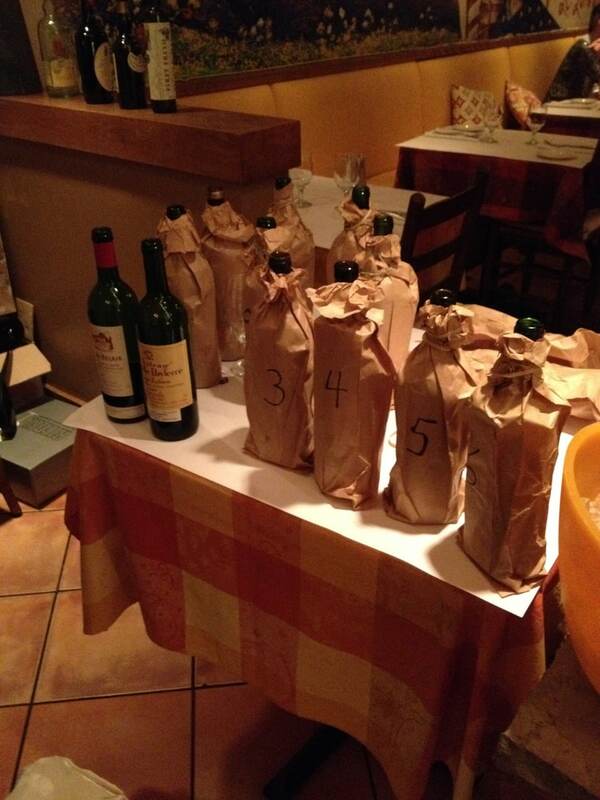 It was a single blind tasting, in that we knew beforehand which wines (for the most part) we were going to try and that they all came from Bordeaux. Most bottles were decanted for sediment/aeration beforehand. Here the notes as we tasted most wines in pairs, although several corked wines sadly disrupted the rhythm. And three were perhaps not showing as well as other bottles have had in the past… Wines in bold I liked in particular. In red and bold, even more. When underlined, the best. 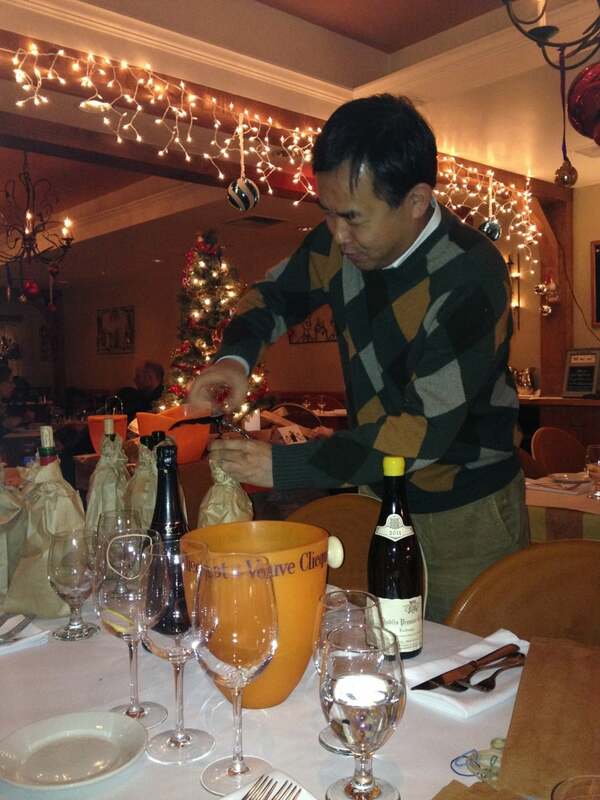 Thanks to Kevin Shin for bringing a fine François Raveneau Chablis 1er Cru Butteaux 2011, which was closed at first – popped and poured. Then came a creamy aspect on the nose that is rather typical of Raveneau wines, I understand. I enjoyed the lemon/lime aromatics and flavors that came subsequently. A touch of underripe fruit but overall very pleasing. The wine improved with time in glass. A moderate finish. 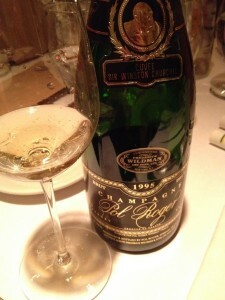 Randy brought a richly styled Pol Roger Winston Churchill 1995 vintage, which I liked a lot. Certainly not as exciting as a 1996, but “honest to the vintage”, marked by opulence if not as much precision. The bubbles were subtle, and perhaps the wine was a touch over evolved, at least Randy thought so. But in the end, the finish had both zest and lift. Very enjoyable. Wine 1 (Château Bélair Saint Emilion Premier Grand Cru Classé 1990): At my end of the table, tasting with Randy, Kevin, Paul and Ken Brown, we all thought that this was more developed and guessed 1982. I had brought this bottle, after it was given to me some 8 years ago by Pascal Delbeck, then owner of this estate, which has since been rechristened Belair-Monange under Moueix ownership. In spite of Delbeck’s early picking, the wine is rather ripe and even somewhat heady, but in a pleasingly restrained manner. It is not bold. It exudes a mild earthiness with mushroom characteristics and receding dark fruit. A wine that would have gone well with my cream of mushroom soup. Wine 2 (Château Léoville Poyferré Saint Julien 2nd Growth 1990): Both Kevin and I thought that this could have been the Léoville Las Cases 1990, because the structure was showing more. It is important to note that the wine – and several others – were rather cold, so that the alcohol and aromatics were not as evident initially. Ken Brown guessed correctly however. By the time we unveiled the wine, it was “singing” and proved to be indeed the most opulent of the three Léoville 1990s we enjoyed that evening. Primary fruit still present. A great wine and one of my favorites that evening. Wine 3 (Château Calon Ségur Saint Estephe 3rd Growth 1982): I enjoyed this wine’s fine grip and evolved tobacco leaf aspect but it also seemed somewhat flat, with a baked fruit aspect. A rather underwhelming show here, as this group has tasted better bottles of Calon Ségur 1982 in the recent past. Good but not great. Ken Brown generously brought this bottle, and I think he would agree with this assessment. Wine 5 (Château Valandraud Saint Emilion Grand Cru 1995): This was a non 82/90 “pirate” that Kevin Shin brought. I recall trying this wine at owner Jean Luc Thunevin’s Saint Emilion wine bar L’Essentiel back in 2007. This was rather “Californian” in that it was smooth and pleasurable especially on the mid palate. It conveyed red fruit with notes of espresso and chocolate. A concentrated aspect but not over the top. Marked by a somewhat hard finish. Wine 6 (Château Léoville Las Cases Saint Julien 2nd Growth 1990): Served very cold and I at first got a slight whiff of mustiness, but that was fleeting. Over time in glass this developed into possibly my favorite wine of the entire evening. Contained opulence, firm but polished, with subtle expressions of primary fruit and vivid cedar. Suave mid palate concentration teased the palate, before ending with a medium plus finish. I wonder if this may be just warming up to open into something bigger further down the road? Certainly not as evidently “showy” as the Poyferré, but perhaps more “serious”? Thanks to Randy for this bottle. Wine 7 (Château Sociando Mallet Haut Médoc 1990): Sadly, this was corked. 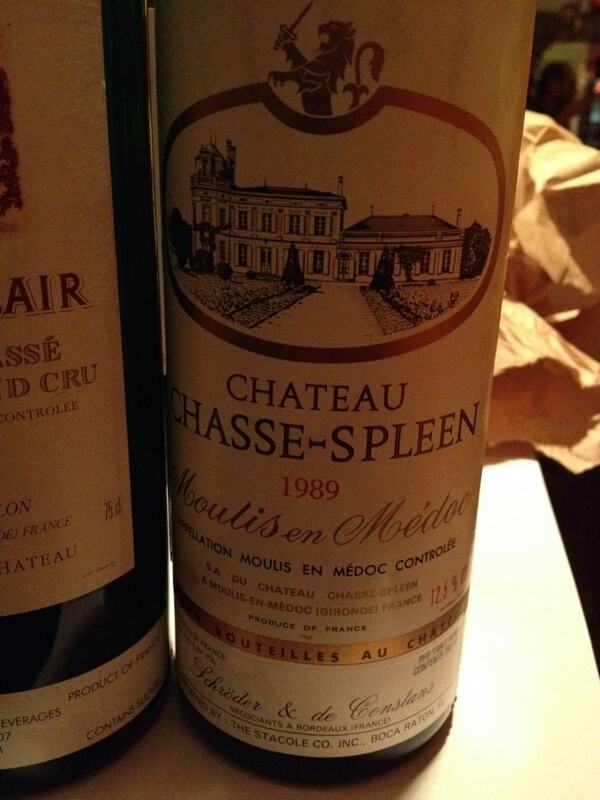 Wine 8 (Château Chasse Spleen Moulis en Médoc 1989):I recall enjoying this last year in France and also about 10 years ago. This was another non 82/90 “pirate” thanks to Mark Arnold. I at first thought it was “glossy” but not “overdone” and foolishly thought it could have been the Léoville Poyferré 1990… Blind tastings are a sure recipe to make a fool of one’s self. In any case, it proved a delicious drink, with some primary fruit still present and good tannic structure. When revisited at the end of the dinner, it did not measure up to, say, the LLC or LP 1990, but it was darn good and probably does not cost all that much even today. Recommended price/quality ratio wine. Wine 12 (Château Canon Saint Emilion Premier Grand Cru Classé 1982): OK, I have loved this wine in the past and really liked it this evening as well. For some reason, I found it slightly lighter than in previous tastings. It did exude a lovely perfumed nose and an engagingly silky palate, but I missed a bit of depth here. Was I expecting too much? Perhaps I was not tasting as well as I should have. Thanks to Charles for contributing this bottle. Wine 13 (Château Gruaud Larose Saint Julien 2nd Growth 1982): Yes, this bottle was a touch flawed, but I did not get the mild TCA taint that some perceived. A sense of higher than usual acidity – a certain sharpness – did not make this an optimal showing of this great wine, but I really liked the mid palate depth. Nevertheless, David Zimmerman, who contributed the bottle, also said that it was not the “best example” of Gruaud Larose 1982. All in all, we lacked some luck, which we hopefully will get in a subsequent gathering early in 2014. Some bottles clearly corked, others not performing up to scratch. 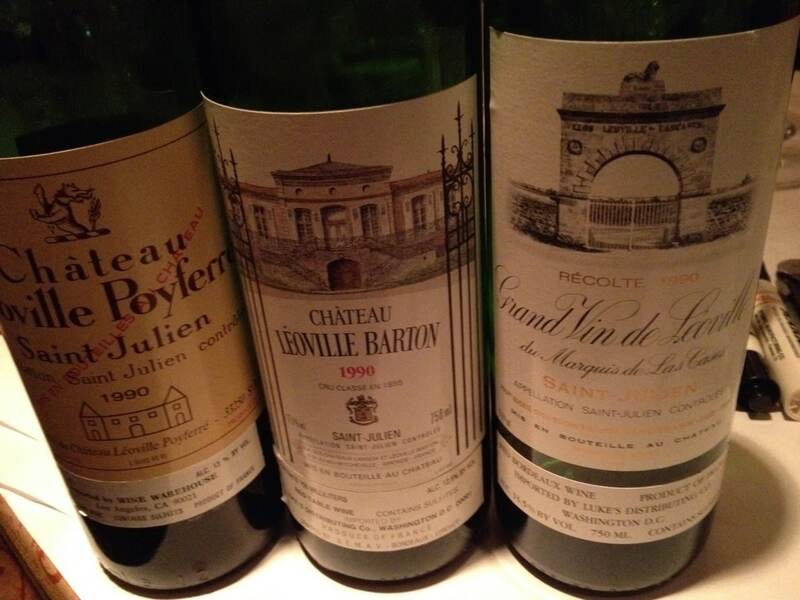 But it was a good time and proof again that both 1982 and 1990, from good bottles, are indeed great vintages with primary fruit and rather youthful.